As a talented child of only ten, Anthony LoSchiavo began his formal art training at the Brooklyn Museum Art School and continued advanced study, on scholarship, at the School of Visual Arts and the Cooper Union in New York. He also attended the Arts Students League as well as private study at the Cape Cod School of Art (founded by Charles W. Hawthorne). Here he concentrated on the Impressionistic method of plein air painting and color theory under Henry Hensche. 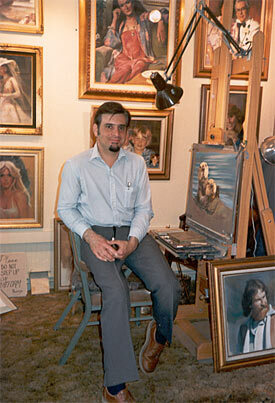 A professional artist for over 40 years, LoSchiavo also owned and operated Faces West Portrait Studio and Gallery on historic Cannery Row for 11 years, establishing a national reputation for his pastel and oil portraits. Mr. LoSchiavo is adept in oil, pastel and watercolor and versatile in his choice of subject matter including landscape, figure painting and seascape. His paintings have been exhibited in juried shows at the Pastel Society of America at the National Art Club in New York, the Monterey Museum of Art, California and the Plein Air Painting Show of the Carmel Art Festival. Anthony LoSchiavo has a reputation for sensitive paintings of beautiful light and effect, enjoyed by collectors world-wide. He is available for private and corporate portrait commissions.